Having seen social media posts from Hide ‘n Seek pop up now and then, I didn’t actually know the location of the business until I looked it up. The business is located on Austin Street, a small side street that connects Pulteney Street and North Terrace. 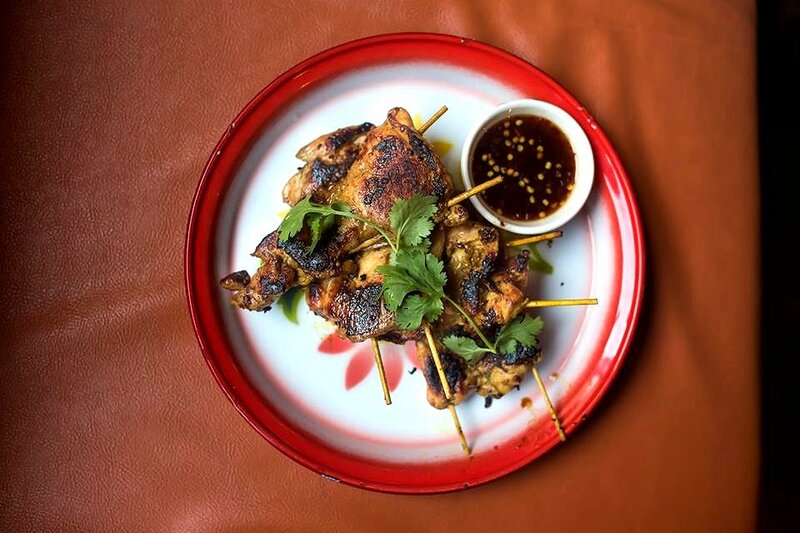 It replaces the former Austin & Austin, and offers a modern take on north eastern Thai cuisine. The team has had extensive experience in hospitality, and have come from many well known eateries in Adelaide. Thai food lovers would find similar offerings at each restaurant or cafe they go to. Not so at Hide ‘n Seek, although there is familiarity with many of the dishes. Personal favourites such as Pad Thai or Mussaman Beef were notably absent. Tonight, I ordered the Gai Yang; herb marinated free range chicken skewers with nam jim jaw sauce. The serving size was generous with four chicken fillet skewers. The chicken was nicely charred on the outside, and juicy and succulent in the centre. The nam jim jaw sauce had a lovely smokey flavour with elements of sweet, spicy and sour. Absolutely perfect with the chicken. The staff were warm, welcoming and very accommodating. The service was fast and efficient, even with the steady stream of customers that came and went throughout the night. While it was considerably warm outside, the inside wasn’t much better. I saw two portable fans in action but it was still hot and humid inside. Entrees are around the $13 mark while mains are a bit higher at around $16. The main I had was quite enjoyable until I found a tiny stone in the dish. The staff were apologetic and decided not to charge me for my meal. I thought it was very handled as not all businesses would approach it in the same way. Hide ‘n Seek is open from Monday to Saturday from 7am-3pm and from 5pm till late.